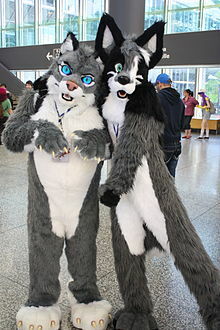 Some furry fans creaut an wear costumes o thair chairacters. The furry fandom is a subcultur interestit in feectional anthropomorphic ainimal chairacters wi human personalities an chairactereestics. ↑ Staeger, Rob (July 26, 2001). "Invasion of the Furries". The Wayne Suburban. Retrieved 2009-05-20.